This week on Fieldstone Common our featured guest is Peter G. Rose, food historian and author of the book Food, Drink and Celebrations of the Hudson Valley Dutch. Peter G. Rose was born in Utrecht, the Netherlands, and was educated there as well as in Switzerland. She came to the United States in the mid-1960s. She has worked as a food writer and contributed a syndicated column on family food and cooking to the New York-based Gannett newspapers for more than twenty years. She has written articles for magazines such as Gourmet and Saveur, as well as for newspapers and magazines in the Netherlands, and locally for Hudson Valley Magazine and The Valley Table. She started her research on the influence of the Dutch on the American kitchen in the early 1980s and published her first book on the subject,The Sensible Cook: Dutch Foodways in the Old and the New World, at the end of that decade. It was followed by Foods of the Hudson: A Seasonal Sampling of the Region’s Bounty (1993); and Matters of Taste: Food and Drink in Seventeenth-Century Dutch Art and Lifewith Dr. Donna R. Barnes (2002). More recently, she published Food, Drink and Celebrations of the Hudson Valley Dutch (2009) and Summer Pleasures, Winter Pleasures: a Hudson Valley Cookbook (2009). 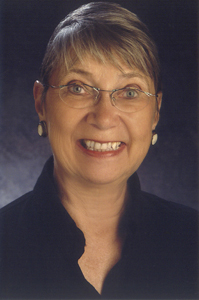 She is the 2002 recipient of the Alice P. Kenney Award for her research and writing on Dutch food history. As a member of the Speakers in the Humanities program of the New York Council for the Humanities, she lectures on historic Dutch food ways all over New York State. She illustrates her talks with paintings of the Dutch Masters and has spoken at many museums with holdings of such Dutch art all around America. She lives with her husband, Don, in the beautiful, historic Hudson Valley of New York. You can learn more about Peter at her website as well as check out her upcoming appearance schedule. In 1609, Henry Hudson, under contract with the Dutch East India Company, set out to discover the lucrative Northwest Passage. The Hudson River Valley is what he discovered instead, and along its banks Dutch culture took hold. While the Dutch influence can still be seen in local architecture and customs, it is food and drink that Peter Rose has made her life’s work. From beer to bread and cookies to coleslaw, “Food, Drink and Celebrations of the Hudson Valley Dutch” is a comprehensive look at this important early American influence, complete with recipes to try. Trade paperback; 157 pages with bibliography, index and some BxW photos and illustrations. 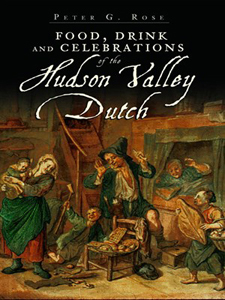 Food, Drink and Celebrations of the Hudson Valley Dutch is available for purchase from Amazon.com and other booksellers. In this interview we talk about the traditions of The Netherlands and how they were brought to New Netherland in America. Our discussion focuses predominantly on the Hudson Valley area of New York. The mainstays of the Dutch diet included bread and beer and a favorite fondness for cookies and pastries. The Hudson Valley Dutch were in close proximity to Native American communities and the two cultures impacted each other’s food traditions. Many Dutch foods worked their way into mainstream American culture such as doughnuts, waffles and cookies. Two copies of Food, Drink and Celebrations of the Hudson Valley Dutch were given out to the Fieldstone Common audience courtesy of The History Press. 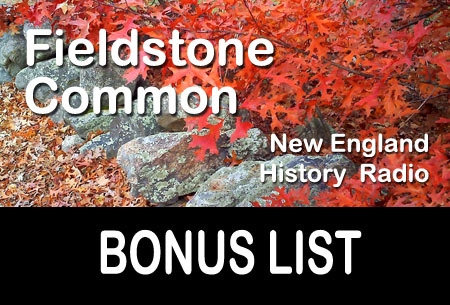 Question: What’s that’s new stuff in the Fieldstone Common title (FC 067)?